Fifteen years ago, if you arrived in our place anytime during the weekend, chances are the FoodTV would be on. Great selection of wonderful shows, a lot to learn in a very entertaining way. Not the case anymore. Even my favorite show, The Kitchen – which I still watch every Saturday – caters more and more to grocery store shortcuts, in a kind of indirect advertisement that irritates me. I am 99% sure Chef Geoffrey Zakarian does not fall for the stuff promoted in the show. It was not the case in the beginning, but obviously money speaks loud. Why do I still tune in? I like those four people together, they have a nice chemistry going on, and every once in a while I find a gem of a recipe (like Jeff Mauro’s eggplant parmigiana). But coming back to what matters, there is one show on the Food Network I like a lot: Girl Meets Farm, with Molly Yeh, a beautiful, super energetic and fun-loving girl who cooks pretty eclectic food, influenced by her Chinese and Jewish backgrounds. And, she loves to bake. From scratch. No cake mixes and shortcuts. There you go. This delicious example came straight from one episode I watched last year. You know, back in 2018. Heat the oven to 350 degrees F. Spray a 9-inch round cake pan with cooking spray and line with parchment paper. I used a Silikomart mold called Water Drop, and 4 small cupcake type molds. 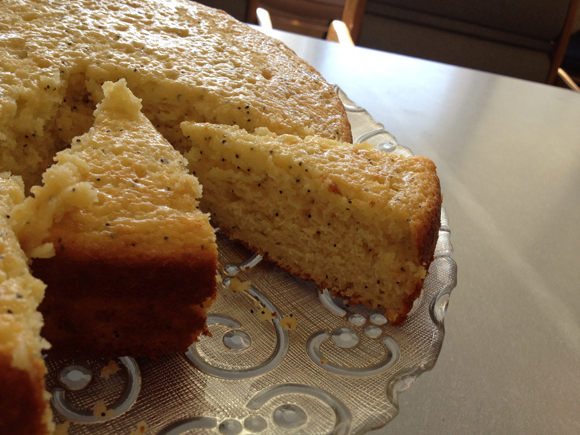 Whisk together the flour, almond flour, poppy seeds, baking powder, salt, baking soda and zest in a medium bowl. Mix the yogurt and lemon juice in a separate small bowl until very smooth. Whisk together the granulated sugar and olive oil in a large bowl until well combined. Add the eggs to the olive oil mixture, one at a time, whisking very well after each, then stir in the almond extract. Add the dry ingredients and yogurt mixture to the olive oil mixture in three alternating additions, whisking after each until just combined. Pour the batter into the prepared pan(s) and bake until a toothpick inserted in the center comes out clean, 35 to 45 minutes. Let cool in the pan for 10 minutes, then turn out onto to a wire rack to cool completely. For the cranberry glaze: Combine the cranberries with 1 tablespoon water in a small saucepan and heat over low heat until the cranberries start to break down and release their juices, 5 to 10 minutes. Pour the cranberries and their juices into a fine-mesh sieve placed over a bowl. Press the mixture through the sieve with a spatula, making sure to scrape off the bottom of the sieve and adding that to the bowl as well. Add the powdered sugar and salt to the bowl and mix until it comes together into a spreadable glaze. If the glaze is too thick, add a couple drops of water until it’s thin enough to spread. If it’s too thin, add more powdered sugar. Pour over the cooled cake. 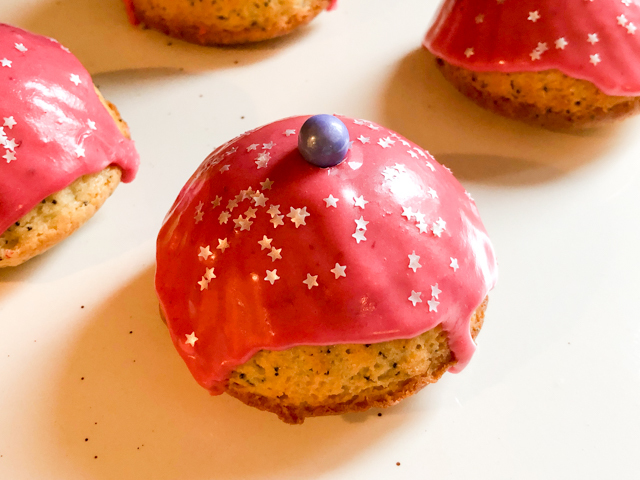 Decorate with sprinkles or slivered almonds, if you like. Comments: This is a recipe for cake-o-phobes, simple, no need to even get your KitchenAid out to play. 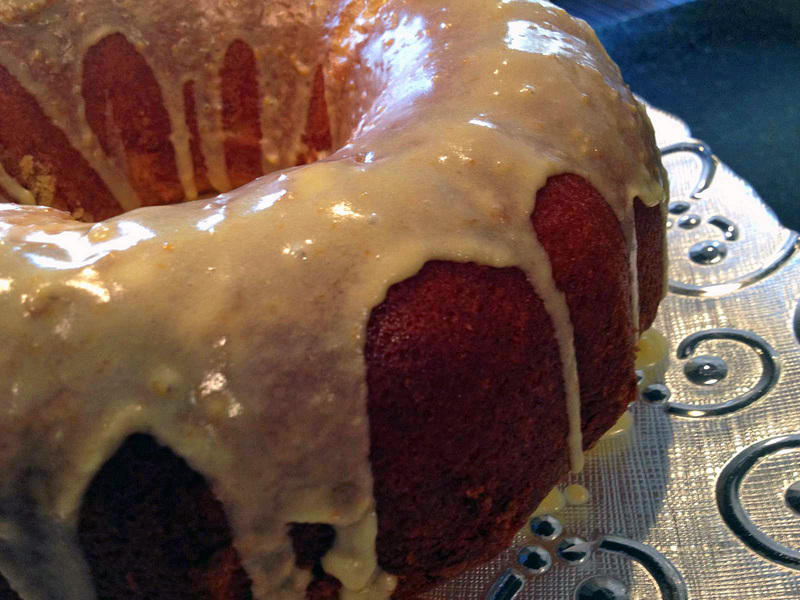 The cake is moist, satisfying, and don’t even think about omitting the glaze, it is just fantastic. The type of glaze that tempts you to go at it with a small knife when no one is looking and turn any leftover cake into its naked self. No, I did not do it. Just considered it. Very seriously so. My glaze was a bit thick, so it did not show the ridges on the baking pans too well, but I still like the delicate effect, the suggestion of a pattern underneath. Lemon, almond, cranberries and poppy seeds. Keep this combination in mind, it’s a real winner! Molds used in this bake: Silikomart Water Drop and Silikomart Parfum. If you have information on programs for recovering silicone mold-addicts, please be so kind and leave me their number in a comment. Thank you. TWO YEARS AGO: Thank you! As I mentioned before, one great food blogger I follow is Helen Fletcher. She is an expert baker, and also a natural teacher. 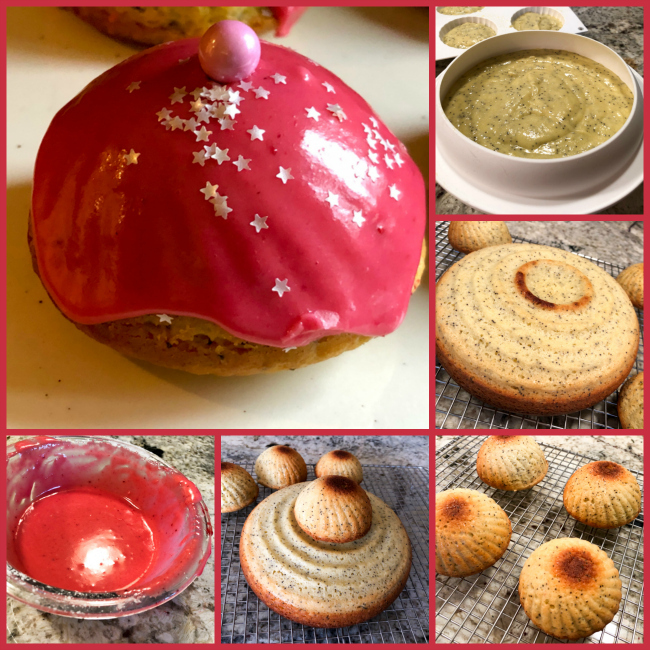 Each of her posts is a detailed tutorial that allows even the most insecure baker (Sally raises her hand…) to feel comfortable to face a little baking challenge. 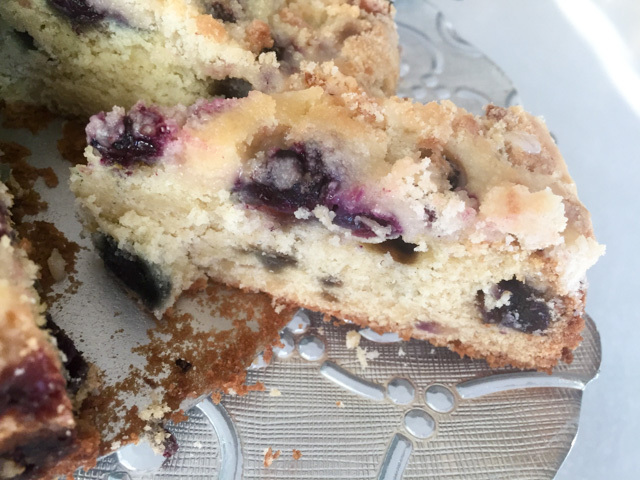 A few months ago she blogged on a Blueberry Coffee Cake that had a nice twist to it, the inclusion of a crumb topping. I was intrigued. 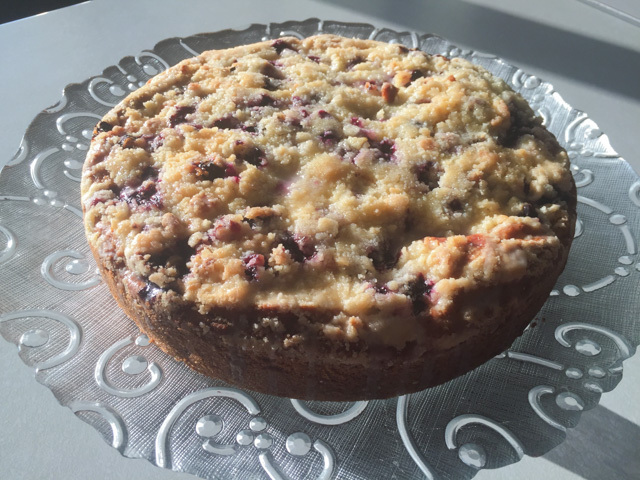 It turned out as a delicious, moist and tender cake, one that prompted Phil to grant me an unexpected compliment: “this is exactly the type of cake my Aunt Mildred would bake and we loved so much!” Can you grasp the full impact of those simple words put together? Me and his Aunt Mildred, joined in the same level of cake baking. I had to hold myself on the side of the counter top, my knees went a bit weak as my blood pressure dropped from the sheer shock of it. And then… then I could not stop smiling. Heat the oven to 350°F. Spray a 9″ cheesecake pan or springform pan and set aside. Combine 2 cups flour and sugar in the bowl of a mixer. Cut the butter into small pieces and add it to the bowl. Mix on low at first until most of the butter has been cut in. Raise the mixer and continue to mixing until crumbs form. Aim for fine, not large crumbs. Remove 1/3 of the crumbs (about 210 grams) and set them aside. They will be used for the topping. Add the remaining 1/4 cup flour, baking soda, egg and buttermilk to the remainder of the crumbs in the bowl. Beat on low to bring it together then on medium to smooth it out. Stir half of the frozen blueberries into the batter. Spread it evenly in the pan. 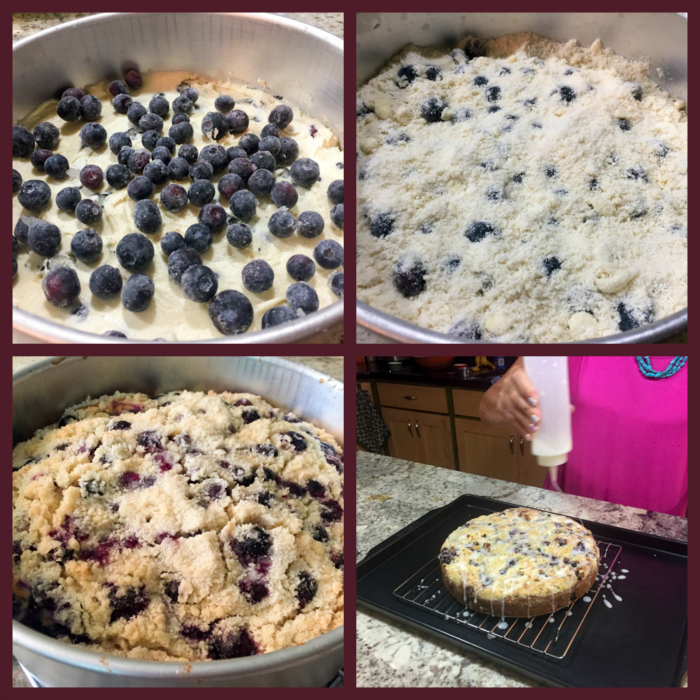 Place the second half of the blueberries over the top of the batter. Sprinkle the reserved crumbs over the blueberries. Bake for 50 to 55 minutes until a tester comes out clean. The crumbs will be light in color. My cake took a little more than 1 hour in the oven. Let cool before removing from the pan. For the glaze, combine the powdered sugar and lemon juice in a bowl and stir until smooth and with the right consistency to be drizzled. Place the cake on a rack over waxed or parchment paper for easy clean up. Drizzle one way,turn the cake and drizzle in the opposite direction. Allow the glaze to set before serving. Comments: for a step by step tutorial, make sure to stop by Helen’s site using the link I provided under the recipe’s title. Once you pour the cake batter in the pan, it will seem as if it’s not enough. Don’t worry, just go on and follow the recipe as specified. I suppose my glaze could have been slightly thicker so that it would stay more as a drizzle, but even if a bit thin, the taste was not compromised. As usual, this was shared with our co-workers on a Monday morning. It is one of my favorite things to do, bake something on Sunday and share with our departmental colleagues. The cake was gone before 9:30hs, which is an excellent indication of approval. But, truth is, I could not ask for a better compliment than that of my beloved husband, the resident cake-critic, the one who was raised by bakers probably as talented as… Helen Fletcher! Helen, thanks so much for another great recipe, I now need to take a deep breath and make your Portokalopita! If anyone is puzzled by the name, go visit her site, it is a cake that uses phyllo dough in the batter! Can you imagine that? Mind blowing! Heat the oven to 350F. Butter a 9-inch round cake pan. Line with a parchment circle and butter the paper. In a large bowl, mix the yogurt, sugar, and lemon zest with a whisk. spoon. Add the eggs and mix well. Add the flour, baking powder, and poppy seeds. Mix until flour is just incorporated. Add the oil and mix well. The batter will look curdled at first but it will come together. Pour the batter into your prepared pan. Bake at 350F for 30-35 minutes, until your cake tester is clean and the cake springs back when lightly touched. Allow cake to cool in pan on a rack for about 15 minutes. Remove cake from the pan and set on a rack to cool completely. 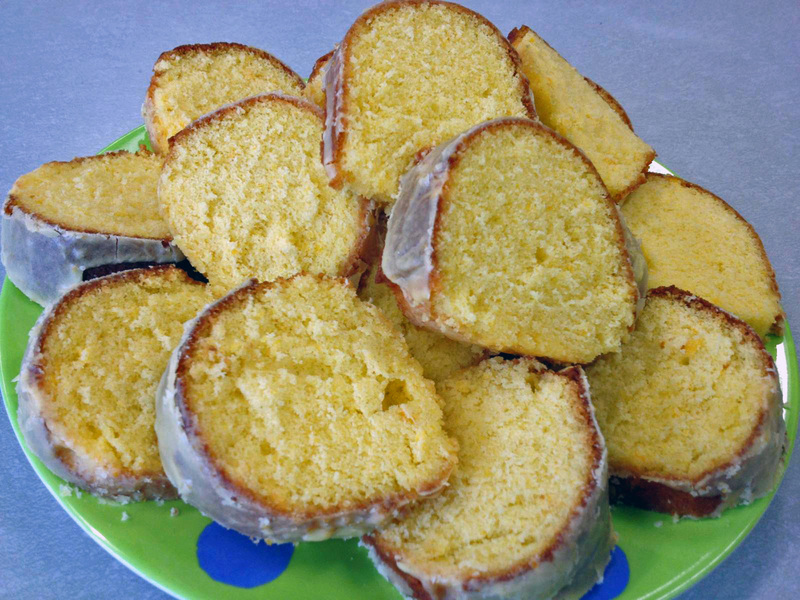 Combine the lemon juice and powdered sugar and spoon it gently over the cake. The glaze will be thin and will soak in like a syrup. 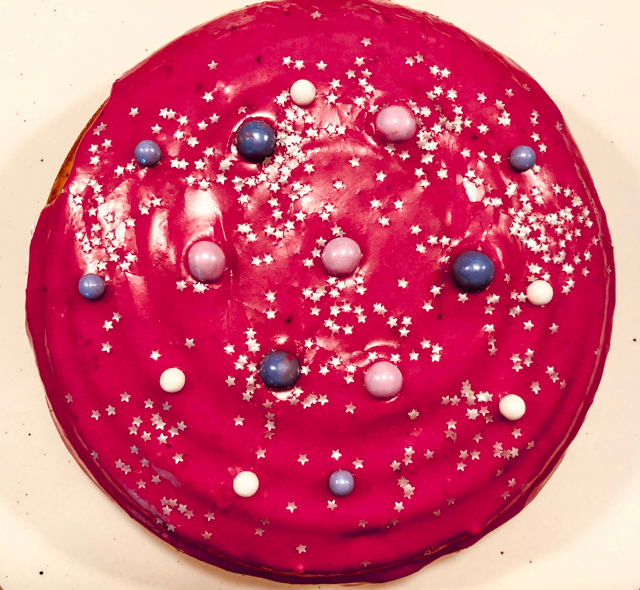 Disclaimer: No bowls were tipped during the making of this cake. Clementines will always remind me of my stepson Alex, as he and his Dad would sit together devouring a few of them after dinner or mid-afternoon on weekends. We made sure to keep a backup bag stored away, just in case. In our neck of the woods, they are sold as cuties, a well-chosen name. 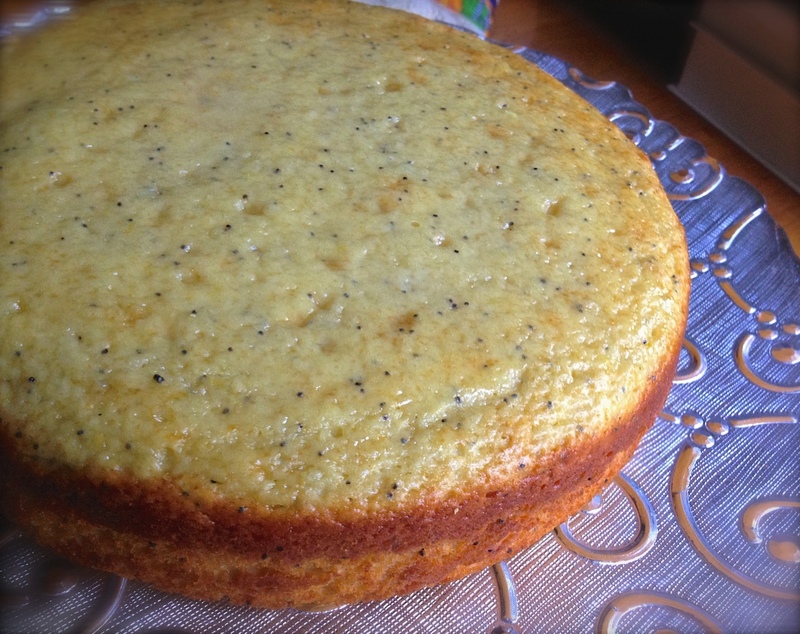 This cake – made in the food processor – is supposed to be very easy. Of course, Sally + Cake = Drama. But it ended reasonably well, except for a burn on my right hand. Actually, two burns. A sticky kitchen floor. And a major spill of orange extract. Grease an 8-cup bundt pan. Peel clementines; cut into quarters. If there are seeds, remove them (they are normally seedless). Process with sugar in food processor until smooth. Add butter, then eggs; processing after each addition until smooth. Add flour, baking powder, and pinch of salt; process until combined. Spoon into prepared pan. Bake in 350-degree oven for 40 to 50 minutes or until golden. Cool on rack for 10 minutes. Remove cake from pan. For icing: Grate and squeeze juice from clementine. 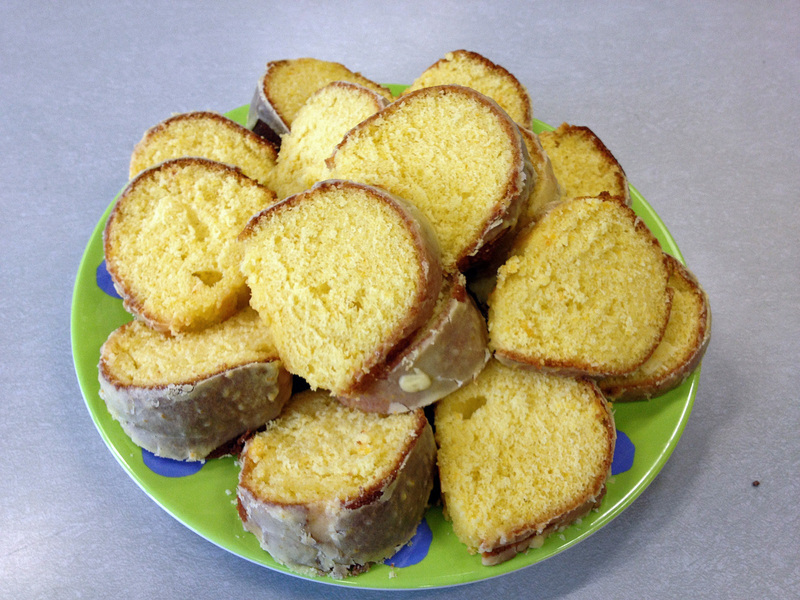 In food processor, measure 1 teaspoon rind and 2 tablespoons juice; add butter, confectioners’ sugar and liqueur. Process until smooth. Drizzle over cake. Although I greased the pan well, some parts of the cake stuck while unmolding. I went Zen, and carefully lifted the stuck parts, patching them nicely back on top of the cake. I expected the icing to hide my poor baking skills. That takes me to the icing part. Since I did not have orange liqueur and the orange extract seemed quite strong, I reduced the amount to 1/4 teaspoon. Eyeballed a little water to compensate. It seemed too thick, so I added more water. That was a mistake in judgment. The icing ended up too thin and failed to cover the cut and paste job on the surface of the cake. 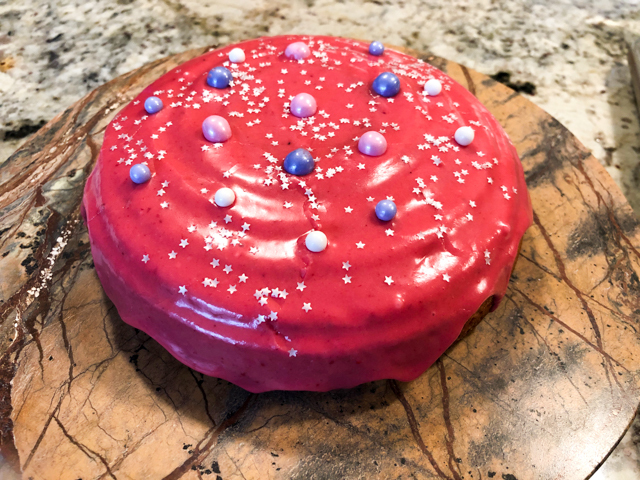 It explains why you only see a close-up photo of my production… I may not know how to bake a perfect cake, but I can point the camera like a pro! 😉 Anyway, I took the cake to the department already sliced, so the boo-boos were less evident.